Most of you will know Evan Jones for the magnificent image which adorns the front cover of The Flora of Sussex (2018). However, he is not only a gifted photographer , but also a gifted and avid all round naturalist, with a particular interest in the wild life of Pevensey Levels. He has been exploring the lesser-known corners of this SSSI for some time now, to begin with mainly for its invertebrates and latterly also its vascular plants. He has kindly invited me to accompany him on a couple of occasions this year, and what follows is a short if somewhat loose-knit summary of our botanical findings so far. On the first occasion priority was given to a meadow on the western edge of the Levels, used by the farmer for light sheep grazing and cut for hay in early summer. 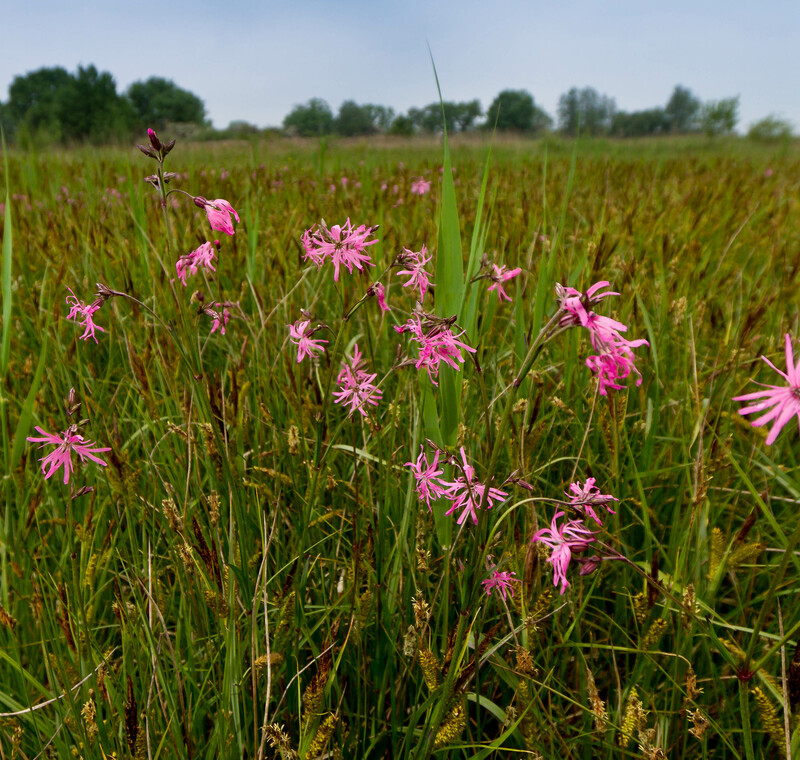 It has a particularly fine display of Silene flos-cuculi , but that is far from all. There was plentiful Lysimachia nummularia (not recorded in this tetrad, TQ60D, since the Sussex Plant Atlas), Myosotis laxa, Silaum silaus and Oenanthe fistulosa — a chararacteristic species of ditches on the Levels, but here growing and doing well on the “flat”. Most pleasing of all, however, was a wetter area in the centre of the meadow dominated by an extensive colony of Carex nigra, a species I have never seen before in East Sussex, although admittedly with a stronghold to the north-west in Ashdown Forest. Other carices found in this first meadow, picking out either its damper or its drier areas, included C. disticha, C. leporina, C. riparia, C. hirta, C. spicata, C. otrubae and C. flacca — an unusually varied haul for Levels grassland? 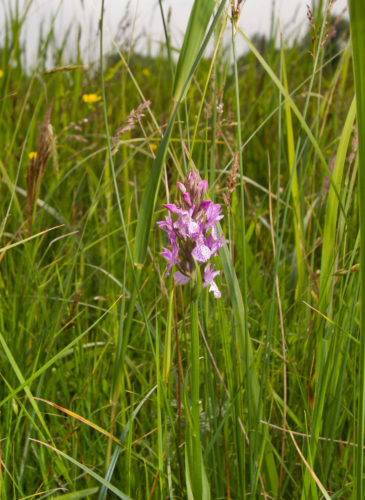 We returned to this meadow a few days later on 10 June, to confirm and photograph a flowering plant of Dactylorhiza praetermissa — an unusually pale, few-flowered specimen but I think “pure-of-blood”, and a good match for left- or right-hand spike in plate XIX of Summerhayes (1951)! We also took the opportunity, on this second occasion, to explore another field, on the recommendation of the farmer, a little way to the south-west of the first one. After an unpromising start we found ourselves walking through an impressive drift of Lotus corniculatus. A dense carpet far surpassing anything I have ever seen on chalk downland. In the distance, a damp area was picked out by a very conspicuous stand of Phalaris arundinacea, accompanied, it turned out at close quarters, by a far less conspicuous population of Eleocharis palustris. 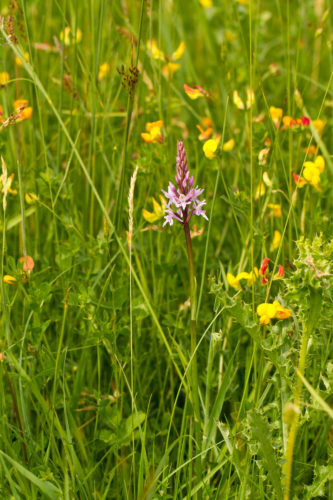 There were scattered spikes of Dactylorhiza fuchsii and in one hallowed spot, a second perfect flowering spike of D. praetermissa — not only the second for the day, but the second for the Levels, too, or so it would seem from the records. In damper fringes were snowy patches of Galium palustre spangled with the blue of Myosotis laxa, Silene flos-cuculi providing the odd spidery dab of pink. In drier areas the yellow flower clusters of Lathyrus pratensis would soon be jostling for attention with the violet-blue racemes of Vicia cracca. The field on the other side of the road, owned by the same farmer, was less interesting with a few damper rushy areas and a sward dominated by Carex leporina. 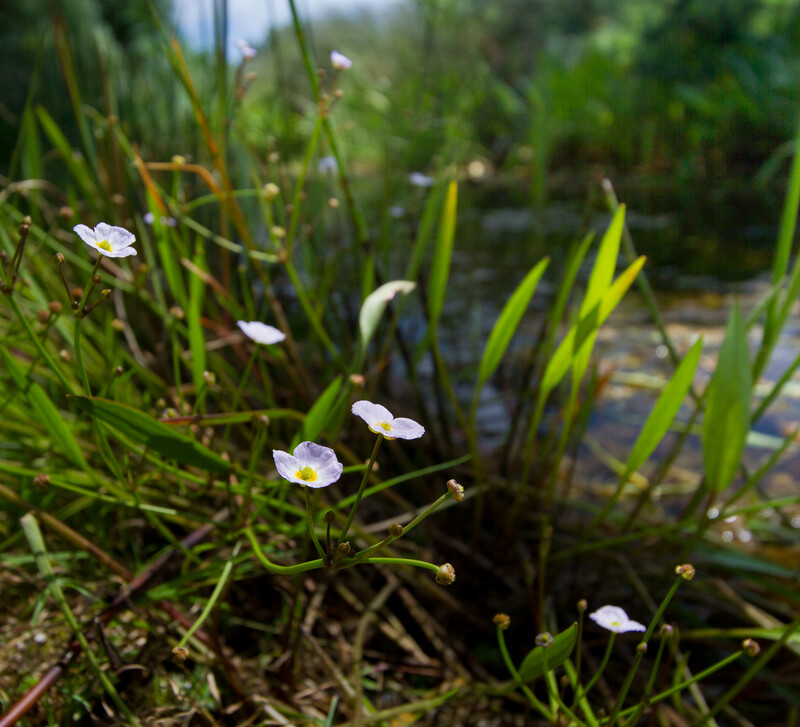 The ditches we saw on our travels were good, of course, containing as they did such Levels specialities as Hottonia palustris, Alisma lanceolatum, Wolffia arrhiza, Oenanthe aquatica, and in a ditch near Rickney, the only plants or perhaps plant of Rorippa amphibia I have ever seen on the Levels. At one point on our perambulations, Evan wondered aloud if the Levels should be as well known for their meadow as for their ditch flora. 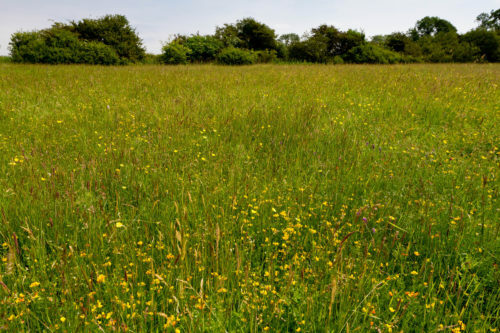 It is an interesting question, and in light of Evan’s recent (17 June) discovery of Baldellia ranunculoides in a ditch bounding the meadow described at the beginning of this ramble, even harder to answer in favour of the former! 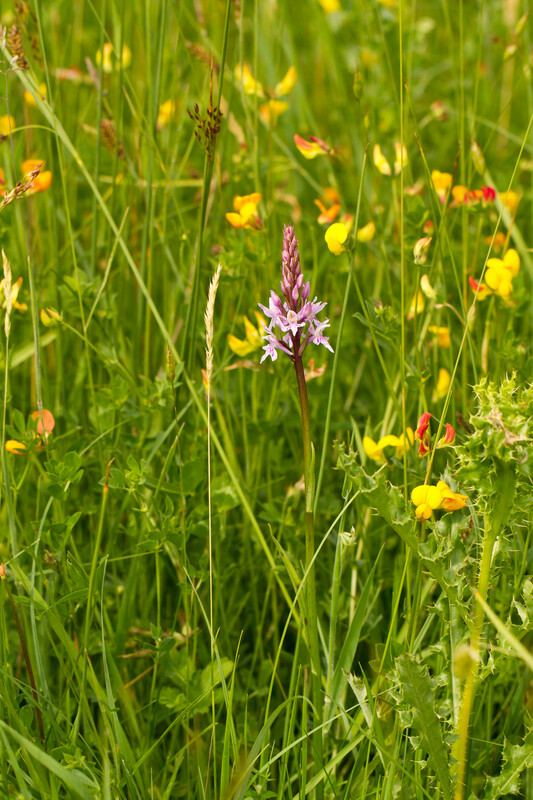 Perhaps we should lower our sights somewhat and ask if its meadow flora is greatly under-rated. To which question the answer is that we do not really know. But should we? 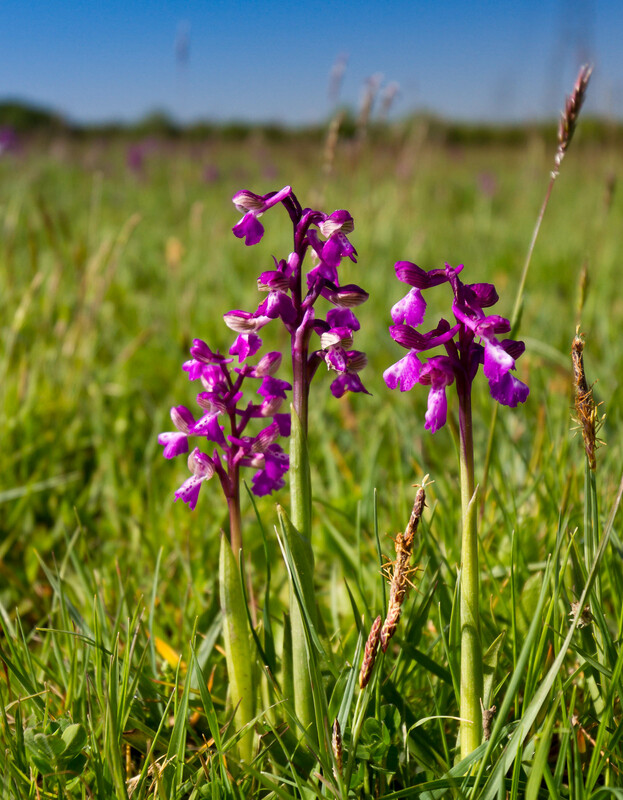 Any preliminary list of Levels meadow specialities would, of course, have to include the spectacular displays of Anacamptis morio found in fields near Rickney every spring. I must admit I had never quite realised the full extent of them. But what of the less obvious treasures? Could there be equally strong colonies of Carex nigra elsewhere within the boundaries of the SSSI, or just outside them? Why are there so few (no previous?) records of Southern Marsh-orchid on Pevensey Levels, also known as “Pevensey Marshes” after all? Has it been chronically under reported; or has there been or is there now a genuine lack of suitable habitat? 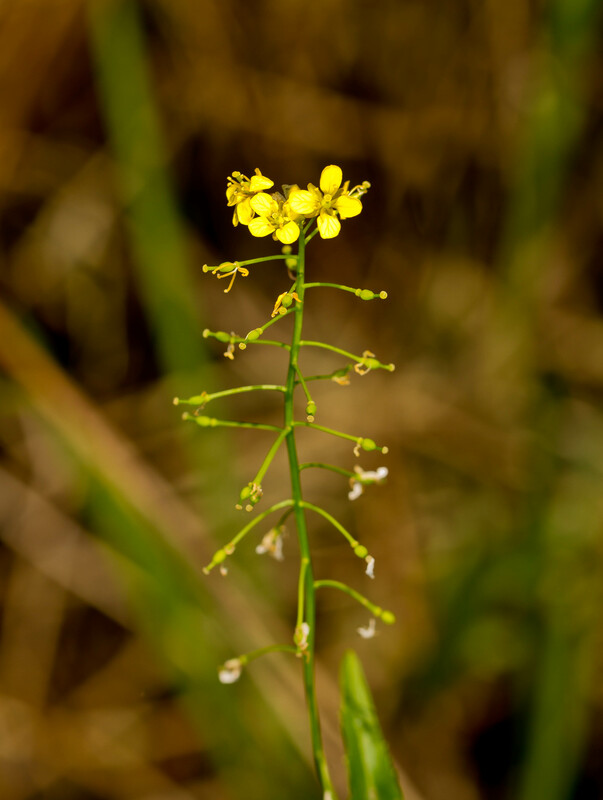 Are these meadows “one-offs” or might there be other herb-rich gems awaiting discovery? And what, if anything, can be done to protect for the future the ones we know about already? Are there other equally pertinent questions we are not yet even thinking to pose about this marvellous part of East Sussex? Thanks to Evan’s efforts we might soon have answers to some of these questions.